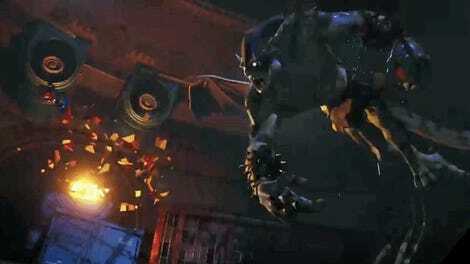 Miles Morales going for a joy ride. The idea of Sony churning out yet another Spider-Man origin story for the big screen has been something of a running joke because of how many times it’s been done. 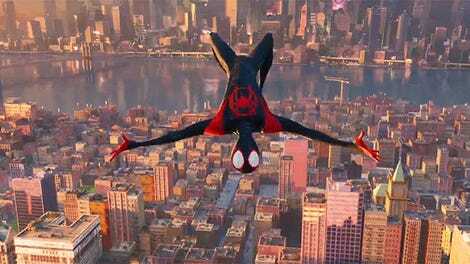 But with the animated Spider-Man: Into the Spider-Verse— from writers Phil Lord and Rodney Rothman, and directors Bob Persichetti, Peter Ramsey, and Rothman—the studio’s created something truly amazing: an origin movie that breaks the mold by leading with the idea that both you and Miles Morales are the heroes. Both because of and despite all the Spider-People woven into its plot, Into the Spider-Verse is undeniably Miles Morales’ (Shemiek Moore) story—a story about a black, Puerto Rican, bilingual teenager from Brooklyn who finds himself being torn between multiple worlds. The movie’s story is driven by the discovery of parallel universes, but the most important “worlds” Miles deals with are far more grounded and relatable. He loves his neighborhood and school friends, but his parents Jefferson (Brian Tyree Henry) and Rio (Luna Vélez) insist on shipping him off to the Vision Academy, a somewhat distant magnet school where he’s able to keep up academically, but not without a degree of uncertainty about his presence there looming over him. Miles grapples with an all-too-relatable guilt about attending an academy that one can only get into via lottery, something that in his mind creates an unfair barrier between himself and the friends he grew up with. It’s the kind of complicated perspective on one’s place in the world that speaks to the experiences of so many black and brown kids whose parents fight to give their kids the same kinds of advantages that Miles’ family wants for him. Interestingly, it’s this inner conflict that comes to inform a lot of Miles’ journey into the titular Spider-Verse. Torn up though he is, his parents remind him that luck was never what got him into the academy, it was also his willingness to put in the hard work to make that happen. Miles and his parents Jefferson and Rio. While this might sound like a heartwarming, though ultimately minor, aspect of Into the Spider-Verse, it’s actually how the film takes the well-known “with great power comes great responsibility” phrase and turns it into something new to define Miles’ Spider-Man persona. For this young man, it’s the world’s expectations he has to bear and, as luck would have it, said expectations are incredibly high. The moment that Into the Spider-Verse’s take on Peter Parker (Jake Johnson) steps onto the screen, you immediately get the distinct sense that he’s a man out of space as time, both literally and figuratively speaking. Paying very close attention to his initial appearance telegraphs that there’s something amiss about his presence and Into the Spider-Verse cannily uses that to reinforce the idea that, again, the movie’s not really about Peter. Rather, Peter swings into Miles’ life to introduce him to a new part of himself that’s connected to the much larger multiverse of Spider-People who each became champions for justice in their own unique ways. In Miles, Peter sees that same spark and potential that allowed him to become Spider-Man, but at the same time, immediately understands that for all their inherent similarities, they’re not at all the same person, and that trying to teach Miles to be like him would be a mistake. Miles also sees that Peter isn’t the kind of person that he wants to grow up to be, and it’s this mutual understanding that makes their partnership so interesting to watch because it repeatedly feels as if the pair are growing and learning from one another organically. Peter and Miles having some burgers. A few years ago, the idea of giving a character as iconic as Miles their first big screen debut in an animated feature seemed almost like a slight, considering how live-action comic book adaptations are the films that now dominate the box office. But Spider-Man: Into the Spider-Verse proves that the medium isn’t at all something that has to hold a franchise like this back. Though most of the supporting Spider-People—Spider-Gwen (Hailee Steinfeld), Spider-Noir (Nic Cage), Peni Parker Kimiko Glen), and Spider-Ham (John Mulaney)—have comparatively small roles within Into the Spider-Verse’s larger picture, their unique aesthetics are a testament to the film’s astoundingly dynamic visual language. At multiple points in the film, the story ever so slightly fades into the background to make room for what’s best described as a postmodern kaleidoscope of sound and light. 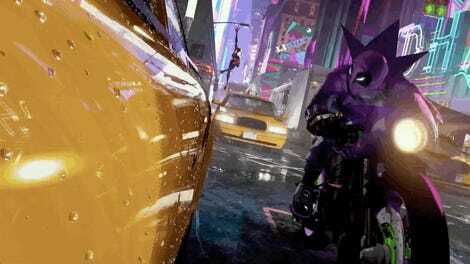 At rest, Into the Spider-Verse is lush and alive and bathed in every single saturated hue imaginable. In action, though, the film becomes something more akin to a gorgeous, mixed-media diorama packed with dynamic, fluid movement that makes you want to reach out and touch the screen. It’s the little things, like Miles’ Spider-Sense initially manifesting itself as internal dialogue that’s visually represented by yellow comics caption boxes, that really make you appreciate just how much thought and care went into the movie’s visuals and how much fun the creative team clearly had crafting them. The Spider-Gang hanging out on Miles’ ceiling. But out of all the feats Into the Spider-Verse manages to pull off, the most impressive is the presentation of a Spider-Man Origin Story™ that’s just self-aware enough to avoid being either exhausting or boring. Sony knows that we’ve all seen Tobey Maguire, Andrew Garfield, and all the other animated Peter Parkers) get bit by the spider, gain their powers, and then end up watching their Uncles Ben die before. Instead of sidestepping that part of Spider-Man’s mythos entirely, Into the Spider-Verse cheekily nods to our familiarity with it in subtle ways while giving Miles and the other Spider-Folks’ origins their deserved space to shine. What’s more, Into the Spider-Verse uses our familiarity with Spider-Man’s lore to tell us that the feelings we have about the heroes—their goofiness, their willingness to put themselves in danger to save the people they love—are proof that we’ve all got what it takes to become Spider-themed heroes. 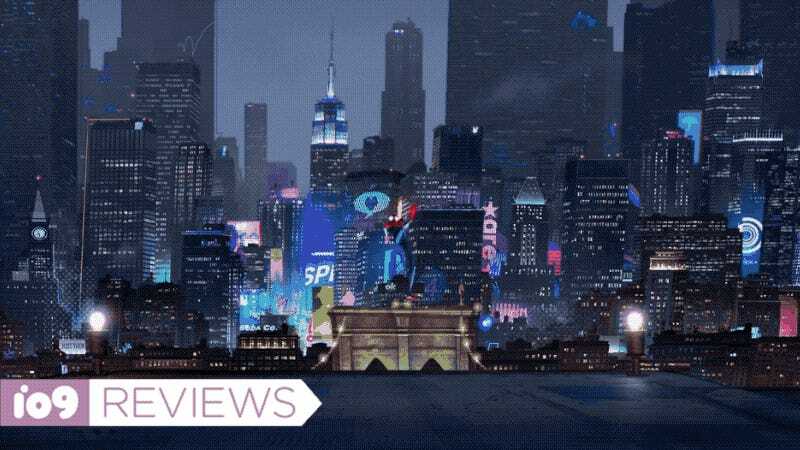 Web-slinging and sticking to walls is cool, but that’s Spider-Man: Into the Spider-Verse’s greatest superpower, and it’s what makes it one of the best comic book movies in years. Edit note: As a lot of you have pointed out, no, we never see Tom Holland’s Peter Parker get bit or witness his Uncle Ben Dying.